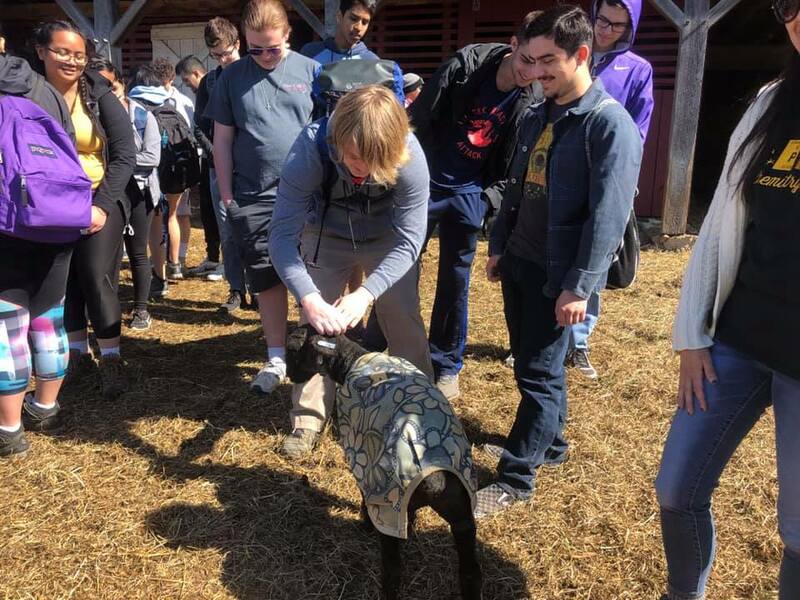 High schoolers to farms on a perfect spring day. Brilliant! What connections and understanding of well-produced food and fiber can be fostered through meeting producers and seeing their craft first hand? PLENTY! Huge thanks to our education program director Joyce Bailey, of Shepherd's Hey Farm, Greg Glenn of Rocklands Farm Winery, and MCA's president Gene Kingsbury, 5th gen owner-operator of Kingsbury's Orchard. 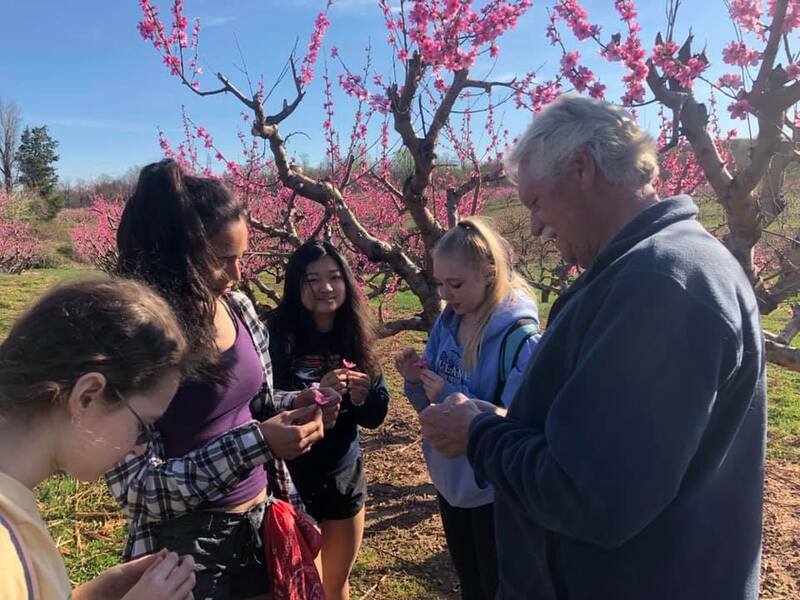 Gene shows students the fruit forming in the blossoms. He explains that the orchard practices integrated pest management in order to minimize chemical inputs. His use of mating band disrupters (pheromones) that stymie male peach borers has resulted in no chemical spraying for that devastating insect. Greg Glenn at Rocklands Farm shares how livestock helps regenerate pasture. In the early 1980s, Lee Langstaff took a casual knitting class with one of her friends, and little did she know how this knitting class would change her life. 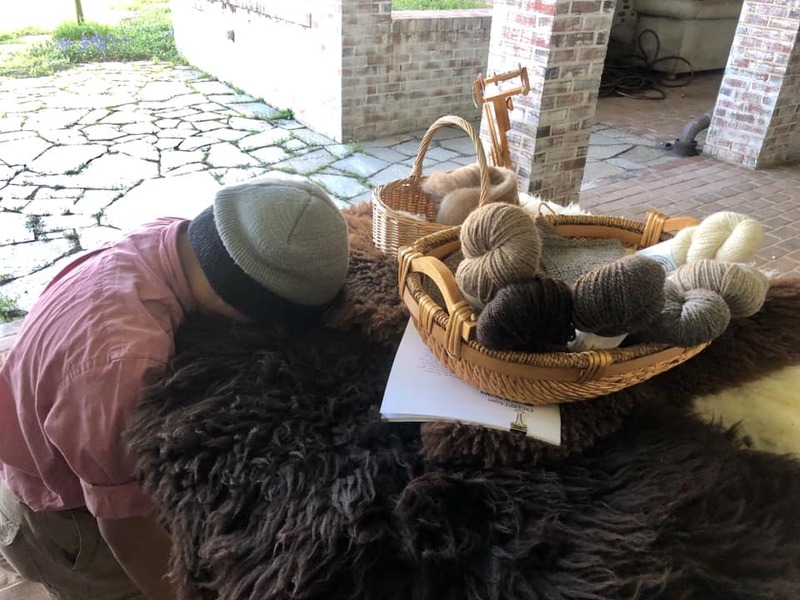 “I fell in love with the wool as soon as I touched it.” Over the next few years she started learning how to spin wool, and took advantage of her close proximity to the Maryland Sheep and Wool Festival, the largest of its kind in the United States. 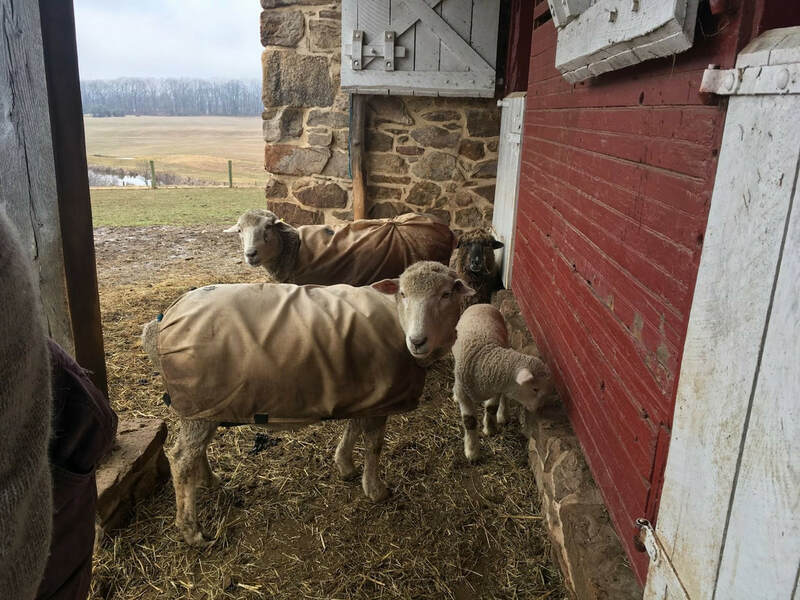 Once her brother purchased a farm on the Montgomery County Agricultural Reserve, she really began to explore the the foundations of wool and fiber farming, and Shepherd’s Hey Farm was born. At first the family had a small starter group of a few rams and ewes, and little by little the farm began to grow. This year they birthed 43 new lambs! Lee was featured in our "Growing Legacy" film. See Lee (and her flock) in the trailer here. ​Shepherd’s Hey Farm sells high quality wool fleece and spun wool to at the Maryland Sheep and Wool Festival, and also to individuals by request online. Lee breeds the sheep for their natural color, uniformity of the fleece, and good quality crimp, which can influence the spinning process. I was surprised to learn that the sheep wear coats, shown in the picture below. This keeps the wool clean and prevents UV damage from the sun, which changes the color of the wool. ​Shepherd’s Hey can’t keep all of the lambs born on the farm each spring. 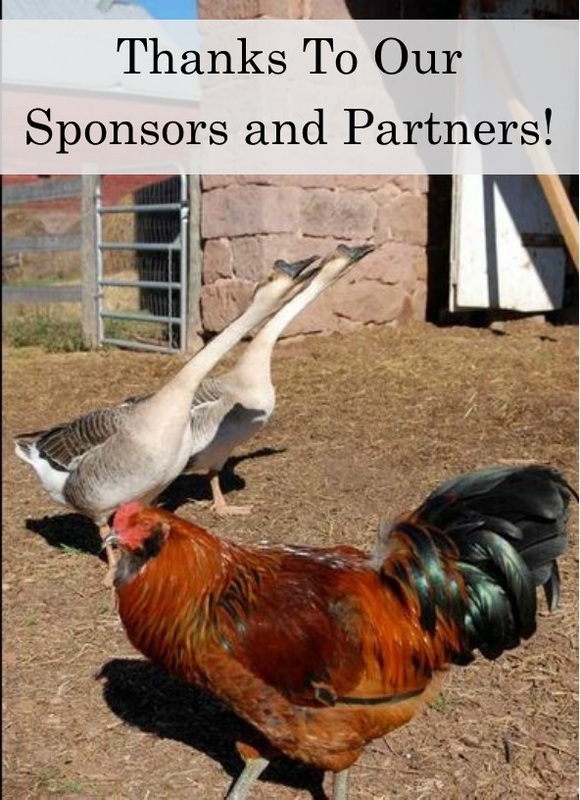 Some are sold to other fiber farms to improve the quality of their breeding stock. Those which are not appropriate for breeding or long term wool production are pasture fed for several months then brought to a local, USDA-approved butcher. Lee takes great pride in knowing where her food comes from, commenting that commenting that “it provides a direct engagement with mindfulness and gratitude" She takes care that the lambs on her farm are raised humanely. ​Lee and her brother David believe that the the Agricultural Reserve contributes to both the farming and larger communities in many ways. The zoning rules and limitations on development mean that farmers can afford to stay on their land, and the close proximity of farming to more developed areas exposes the greater community to the many wonderful things that farmers produce. According to the Farm Bureau Federation, there are 2.1 million farms in the U.S., with 99% being family-owned, but many people have never visited a working farm or have a clear understanding of how farm products are generated. 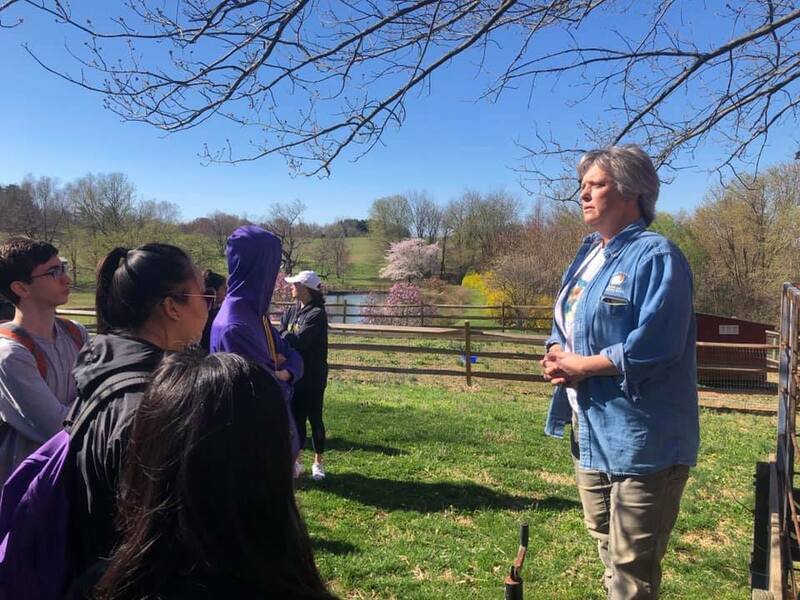 Many Montgomery county residents don’t even realize that a large portion of the county has been reserved for agricultural purposes, but Lee feels that as soon as people see the view and the working farms that make up that view, they fall in love, and that is key to keeping the land safe. She believes the best way to advocate for the Agricultural Reserve is to keep it pristine, and let the view speak for itself. I’ll talk more about how we can all contribute to keeping the Agricultural Reserve clean and trash-free in a future post. ​Shepherd’s Hey allows visits by appointment. If you would like to visit the farm, keep up to date with the new lambs, or purchase some wool, you can follow Shepherd’s Hey Farm on Facebook or stop by their booth at the Maryland Sheep and Wool Festival. ​Is a CSA for Me? Del. Barve, Protect our Forests! Attention Gaithersburg and Rockville Residents! We need your quick action - Delegate Barve plans to vote against a "No Net Forest Loss" bill (HB 120) on the House floor in Annapolis (part of a package of forest bills). He needs to hear from his constituents. Please take a moment today to either call him 410-841-3990 or click "start writing" below to customize our letter template. Del. Barve was named Legislator of the Year in 2017 by the Maryland League of Conservation Voters - let him know we expect him to stand up for forests! Update: HB 735 - The bill mandating study of forest protection passed unanimously in the house. The Fee-in-Lieu bill passed in the senate as well!- thanks so much to all those that wrote in! These bills need your help this week to protect Forests - we can't delay another year- thanks for your quick action! What if there were a product that could provide clean water and air, cool our world, sequester carbon and provide habitat at the same time? If a tech giant were creating such a tool it would have major buzz- the next big thing. But this tool is not flashy or new and it is not of our making - it's trees. While forests offer all these incredible benefits, we are not protecting them as we should at a time that we need their services more than ever. 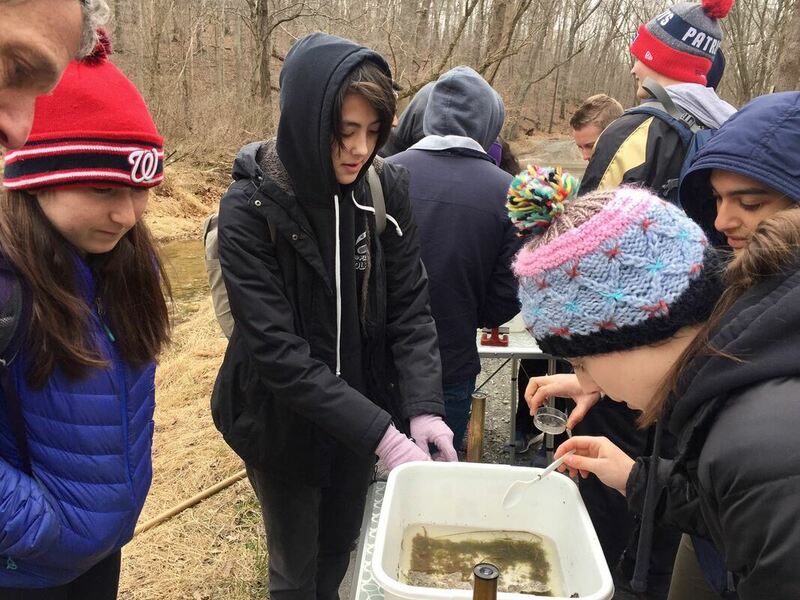 The Chesapeake Bay Program has found Maryland is losing a dozen acres per day. 3 bills in Annapolis aim to reverse this trend - and they need your support. Click "start writing" below to send a quick letter! Properly define "Forests" HB 120 / SB 203 the state's current goal of "no net loss" is flawed. This bill would ensure the state is working to protect real forests that contribute to healthy soils and habitat. Creating a Task Force (HB 735 / SB 729 : Maryland needs a Task Force to address future deforestation and recommend forest improvements. How do we make sure that we have enough affordable housing opportunities here in Montgomery County? We look forward to the continuing conversation and refinements to the amendment to ensure that it meets our shared goals without unintended consequences. ​A video from Landis Construction done Pro-Bono for the County to illustrate ADUs permissible under the proposed ZTA. Below: County Executive staffer Claire Islei reads a statement from Executive Elrich's office on opposition to the ZTA as written. See the full text of Claire Iseli's testimony from the County Executive's office. It references this Rental Housing Study and this report summary. MCA echoes both the support for the intent of ZTA 19-01 and real concern with inattention, thus far, to important details. Specifically, and to be brief here, the ZTA is absent a maximum size of the detached units. We recommend limiting the size to 900 sq ft. as is effectively provided for in Portland. Keeping these units this size or less will better achieve several key stated goals, most notably ensuring that they may be reasonably affordable for the demographics that they intend to serve. 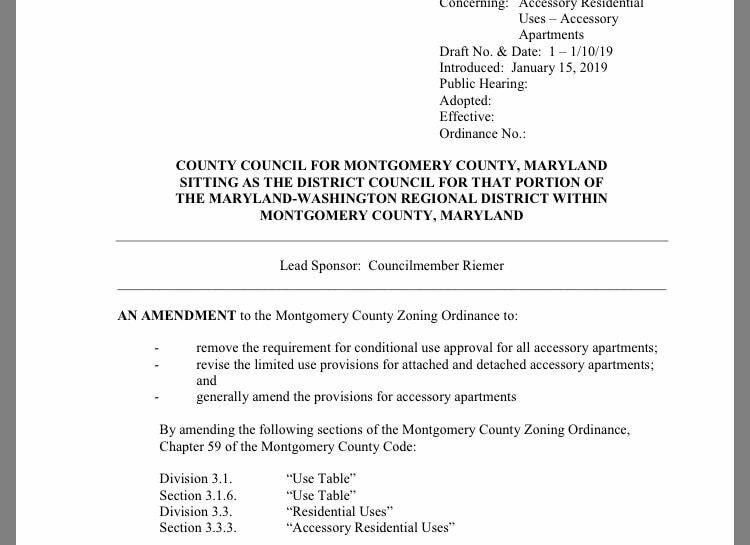 Moreover, properly limiting maximum accessory unit size will help ensure that there will be less potential for significant violations in terms of the number of tenants etc. I look forward to further collaborative conversation on how to advance the goals of the amendment while addressing broadly shared concerns. In particular, I wanted to point out this section below. It is possible that this has already changed, but I just wanted to encourage people to be cautious when trying to acquire seed. Getting sued/arrested for a simple misunderstanding of the laws would be a major bummer. Q: How can a participant obtain industrial hemp seed? A: The department will not be involved or participate in any seed orders to be obtained from other states, including ordering, shipping, or approving such seed procurement. Seed sourced from another state shall be the sole responsibility of the person sourcing and/or procuring and shipping the seed and such person shall bear all legal liability and responsibility for such procurement and shipment. The permit holder must be aware that until the federal government reclassifies industrial hemp, it is still considered a Schedule 1 Drug. The Drug Enforcement Agency (DEA) has jurisdiction covering imports and interstate movement. Under current federal law and DEA regulations, industrial hemp seed is restricted from interstate shipment. Anne and Eric Nordell in PA are famous for their weed control, cover crop system, and vegetable rotations. They have (I think) six acres, and they use draft horses when they need them. They keep about half of their land in cover crops during the growing season, but they do not bring in a lot of off-farm inputs. I think they are now incorporating animals into their system, but in the old days they were all veggies and cut flowers. I would suggest studying their system which has evolved over the last 35 years for regenerative ag ideas that MoCo Producers might be able to use. I am attaching a few links that demonstrate how they started and how they farm now. ​Regenerative farming is such a love and I can chit chat forever! Here are just some of the modern voices in the small, bio-intensive, no-till and regenerative farming arena. Here is my mentor, the maestro, Jean-Martin Fortier. His book, The Market Gardener is a model for successful small farming. He no longer does low till, he has moved to no till. Some of these are older videos. Here at MCA, the shorthand of our mission is "We Connect" if you like the way we are connecting agriculture, climate change and care of the soil, please support our work be becoming a member. 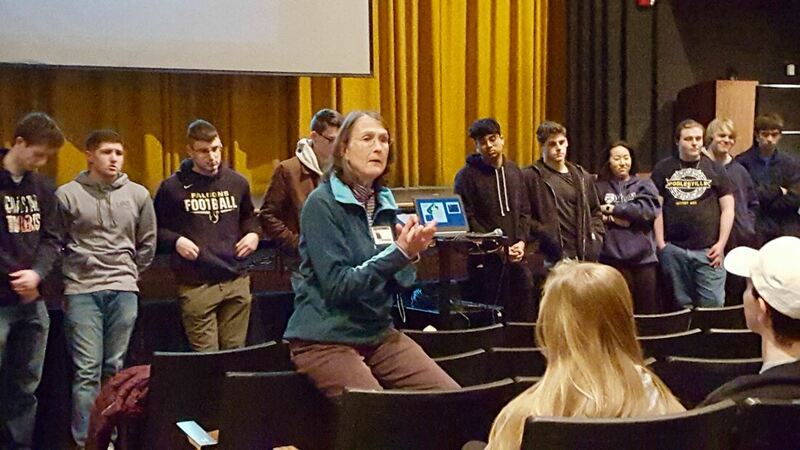 Our hyper-local focus on Montgomery County relies on local support- thanks! Update: HB 403 Passed - the food donation pilot program was extended another 2 years and expanded to Baltimore County. Three cheers to all the food advocates who made this possible! 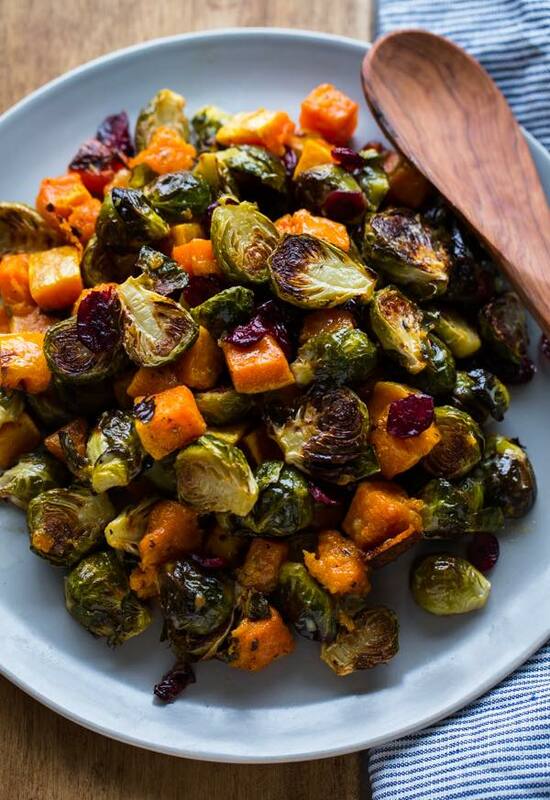 Three Cheers for our Friends at ​Community Food Rescue who are connecting hungry neighbors with good food and reducing food waste. One source of food for hungry folks is donated or gleaned food straight from local farms - farmers can get a tax credit for these donations. Read on for information from CFR on the Farm Food Donation Pilot Program and write state representatives to extend this program before it sunsets at the end of the year. The Farm Food Donation Pilot Program, signed into law by Governor Larry Hogan, allows eligible farmers to take a tax credit for donating unsold surplus farm products to charitable organizations. This three-year pilot program that began in 2017 is available to farms located in Anne Arundel County, Calvert County, Charles County, Montgomery county, Prince George’s County and St. Mary’s County. “This is a way for Maryland farmers to further help their communities and ensure their harvest does not go to waste,” said Governor Hogan. To claim the credit, farmers donate products to non-profit charitable organizations that are Certified Tax Credit Administrators. Farmers fill out a simple MDA Food Donation Pilot Program Form for each food donation and submit it to the non-profit. Non-profit food providers become Certified Tax Credit Administrators by completing and submitting the Application for Tax Credit Administrator Form to the Maryland Department of Agriculture (MDA). Both forms can be found on the Maryland Department of Agriculture website (scroll down right side of the page). This is great opportunity to claim the tax credit during the pilot program. The program is due to expire December 31, 2019. State House Delegates Ebersole and Young recently introduced HB 403 to extend the Farmer Tax Credit to all Maryland Counties through 2022. Please share this tax credit opportunity with farmers and non-profit food providers. Contact Delegates Jay Walker jay.walker@house.state.md.us and Anne Kaiser anne.kaiser@house.state.md.us with the form below to support HB403. It is a win-win-win! Thanks to all that were able to join us for the this session: see the wrap up here. Sophia Maravell grew up on a seed saving organic farm in Montgomery County, MD. She wrote her undergrad thesis on female farmers and ranchers, and started working on sustainable farms in Colorado, Maryland and abroad. 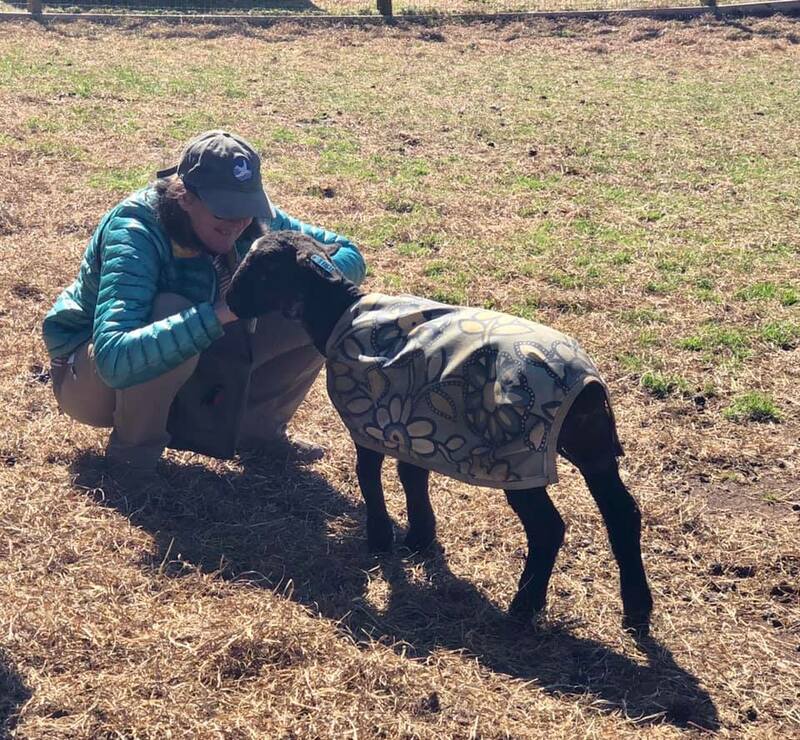 She attended the Farm School's Practical Farm Training Program in Athol, MA and shortly thereafter co-founded Brickyard Educational Farm in Potomac, Maryland. She has her Permaculture Design Certificate from Forested and earned a Master's in Education from Goddard College in Community Education focusing land-based farming and craft communities. She worked as a farm-based educator and co-manager at Hawthorne Valley Farm's Place-based Learning Center. Currently she works at Potomac Vegetable Farms as a community educator and farmer. Sophia is committed to healing through our connection to land. She is committed remembering 'culture' back into 'agriculture' by cultivating beautiful food and community. Nick Maravell has been farming organically for more than 40 years. Concerned about the soil, environment, energy conservation, and fresh, local, and healthy nutrient dense food, he began by selling vegetables to restaurants, local food and farmer co-ops and health food chains, and at farmers markets. Now the farm produces mainly row crops and livestock. 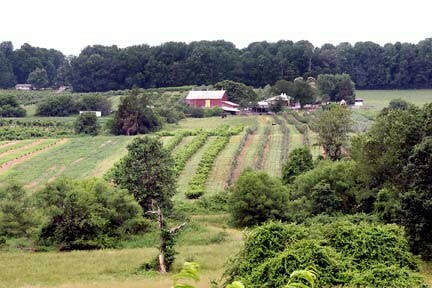 The farm is located on 175 fertile acres in the Frederick Valley in Maryland. 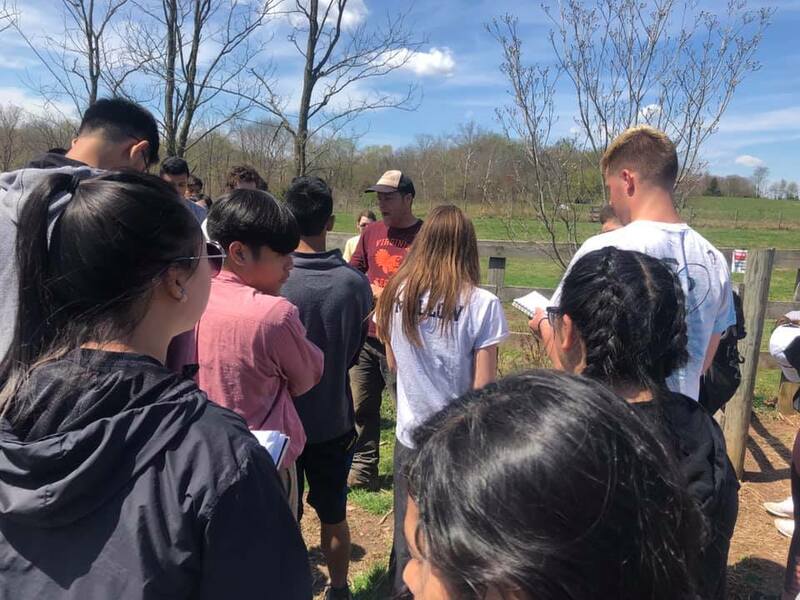 Nick’s Organic Farm uses a diversified grass based organic farming system with rotational grazing, cover crops, and an 8-12 year crop rotation to constantly build the soil. Nick served a five-year term on National Organic Standards Board and is involved in the newly formed Real Organic Project (ROP) which advocates for organic standards that adhere to the basic principles of an ecological soil and pasture. Pete Walton is a farmer and entrepreneur from Northern Virginia, with a passion for soil, trees, and livestock. He has worked on projects ranging from small urban farms, to large scale regenerative grazing systems, and cannabis production on the west coast. Bread, Milk, Paper Towels and Flowers For Your Beloved? Really? CSA options include Gypsy Flower Farm, Grateful Gardeners and Hidden Ridge Flower Farm. Until February 15 Gypsy Flower Farm (Farmer Sid pictured above) is offering 5% the total CSA price and a free Mother's Day Bouquet More info here. If things happen to be getting serious with your Valentine, you may also want to consider using these local farms or Sungold Flower Co. who focuses solely on foraging and harvesting uniquely seasonal flowers for your event. -Is a CSA For Me? -Where is my Farmers Market? Three cheers for Chef Jose Andres and DC Central Kitchen for their work to ensure that furloughed federal workers have access to healthy food during this tough time. The program will remain open through next week as payroll is sorted out. Kudos to MC farmers and hunters who are stepping up to help supply the effort! "We are pleased that we can call upon the bounties of the Ag Reserve and the generosity of its farmers to assist local Federal workers through hardships associated with the recent furloughs." Faithful Pooch Maggie at the Orchard. 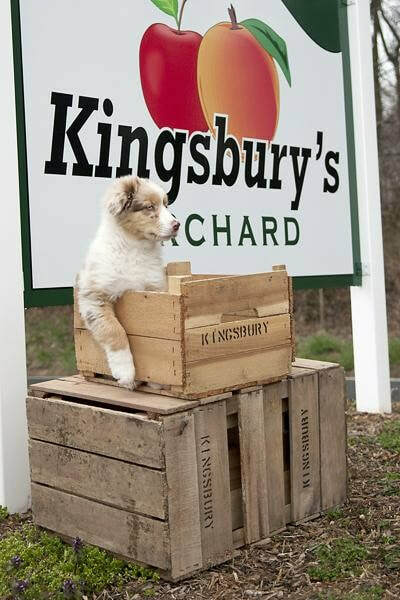 Kingsbury’s Orchard has been a family owned farm since 1907. I talked to fifth generation farmer Gene Kingsbury about his land and crops. In the beginning Gene’s family used the 132 acres for mostly dairy farming, with only a few peach trees. In 1930 his great grandfather, Phil Horine, stepped away from the dairy business and started in the peach orchard business. Gene says his inspiration comes from memories of his grandfather working on their farm. 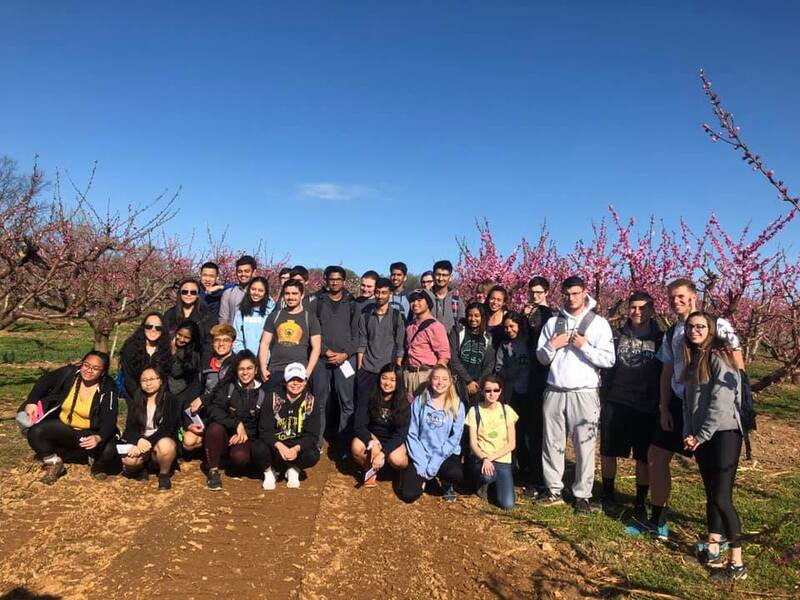 Now Kingsbury’s Orchard uses about 55 acres to grow 50 varieties of peaches, 20 varieties of apples, as well as apricots, pears, sweet cherries, and other fruit trees. Gene has also been called "The Poet Laureate of Peach Tree Road." Read his poems "This Peach" and "Timothy Time"
​Kingsbury’s farm keeps Gene busy as there is work to do for every month, commenting that “orchard work is a year round job.” Pruning goes on throughout the winter months, followed by the planting, fertilizing and thinning seasons. Harvest begins in mid-June starting with sweet cherries, followed by apricots and peaches, and the first peaches ripen in late June and last through September 15th. The apples begin in early August and end in early November. Finally pears begin to ripen in mid-August and last through the end of September. 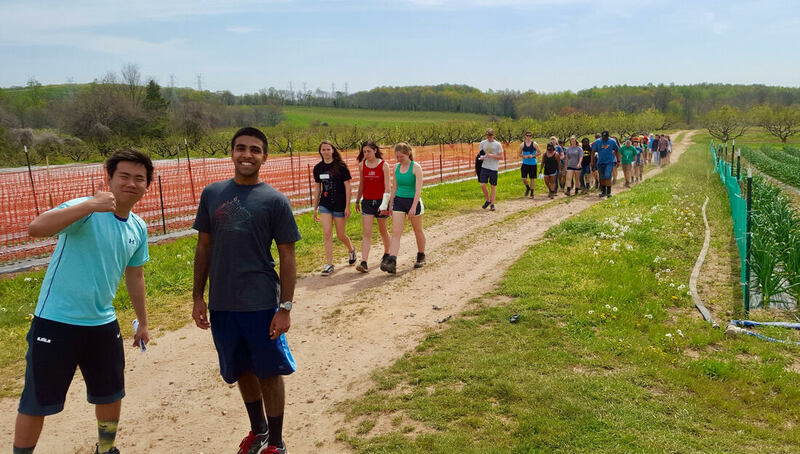 Kingsbury's Orchard uses a specialized integrated pest management plan that has targeted pesticides which reduces the chemicals used on the farm. During the past year weather has been a challenging factor for the farm. “Our record rainfall last year made it extremely difficult to grow and harvest good quality fruit.” This record rainfall is likely a result of the continuing climate change which also creates other difficulties such as spring frost damage, hail, drought, and fruit sunburn from excessive heat. Despite those obstacles Kingsbury Orchard still finds a way to produce, selling 75% of their crops through a retail market on site and the other 25% through local stores such as Giant and Whole Foods. Gene is very appreciative of the Montgomery County Agricultural Reserve, stating that “Kingsbury’s Orchard would not be in business without the help of the Agricultural Reserve, it keeps the land safe and benefits the county's urban areas.” To view harvest schedules, and when to visit the farm please check out the the Kingsbury’s Orchard. 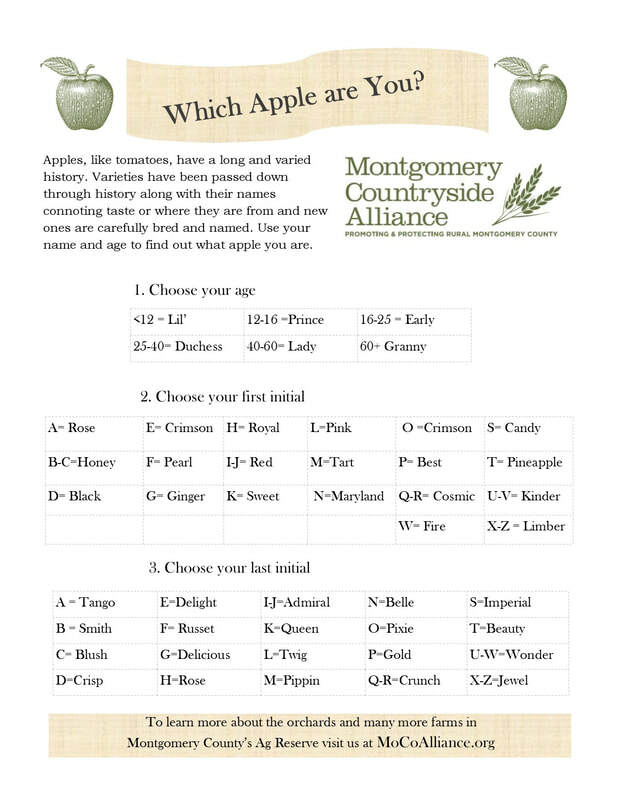 What Would Your Name Be if You Were An Apple Variety? Announcing a new MCA Program that will help reach the county's climate change goals and enhance stream buffers for better water quality. In the County, developers chopping trees must either replant the same number on the site or pay into a "fee in lieu" fund that will re-forest other areas. The Planning Department has used some of this now million dollar fund to re-forest 32 acres of stream buffers in county parks. But we think we can do more, much more. The Reserve is ripe for reforestation on lands that are not suitable for crops. MCA will be matching private landowners with the Planning Department to plan tree plantings. 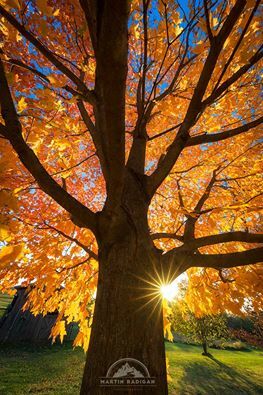 An acre of trees can absorb 68 tons of carbon - the same as taking 17 cars off the road for a year. In rural locations, one acre of forest can produce between $12,000-$77,000 in environmental benefits each year. 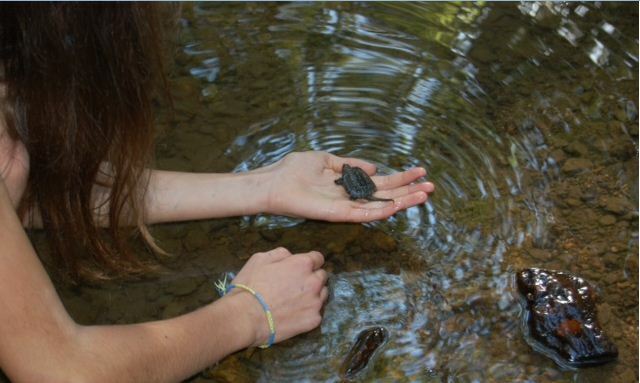 See more on the impact of reforestation from Chesapeake Bay Foundation. Our global climate challenge needs all the solutions we can throw at it. 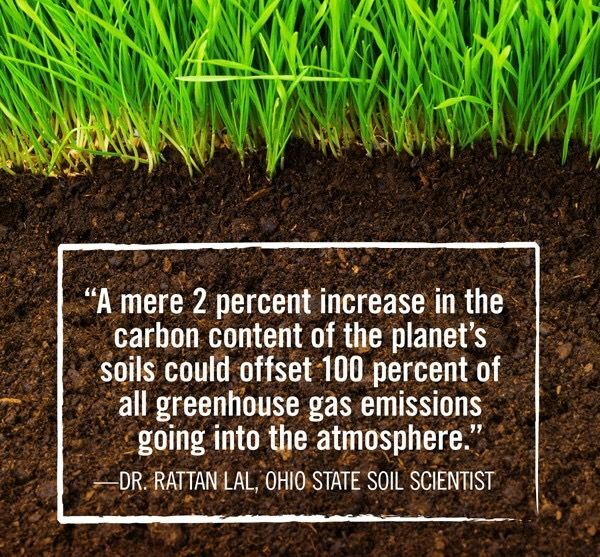 However, along with promotion of Regenerative Agriculture, another project we are taking on this year, reforestation represents huge carbon cutting potential with lower costs than transportation or retrofitting projects. Hemp, Hemp Hooray! A Super -Crop is Legal- now what? It's CSA Season - Is a CSA Right for you?